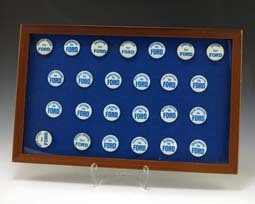 Twenty-five white 1976 Gerald R. Ford presidential campaign buttons in a wooden frame. Each button focuses on a specific ethnicity "for / Ford." The buttons are placed alphabetically and are mounted on a blue piece of felt backing.